smiths. Work to BUN-EI 1264. GUNOME from CHOJI BA resembling the beauty of FUKUOKA. stylized. Note: MORIIYE known for strongly standing HADA. Shinogi-Tsukuri, Ihori-mune of shallow Sori and Chu-Kissaki. Ko-Itame, standing Hada with JiNie and standing Utsuri. Choji with large standing, translucent Kawazu Choji-Midare going to Juka with Ko-Ashi and Yo. Sunagashi clings while Tobiyaki beckons between heads. Chu-width Midare Boshi turns in Ko-Maru. Shinogi-Tsukuri, Ihori-Mune, Koshizori Funbari, Ko-Kissaki. Ko-Itame Hada has standing Midare-Utsuri. Nioi-Fukashi Gunome Choji-Midare Ba in Ko-Nie Deki. Obusa in the mid with Tobi-Yaki. Sunagashi and Kinsuji stream through figures. Ubu, slightly Kurijiri Nakago has two Mekugi-ana. Signed in the Ji. 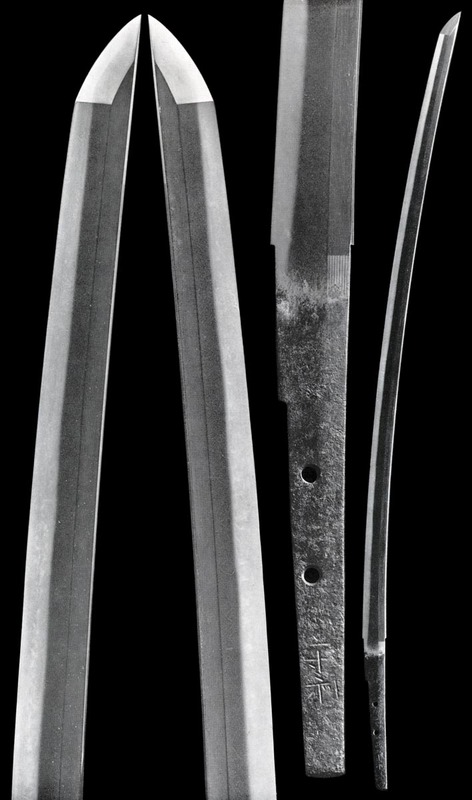 SHINOGI-TSUKURI, IHORI-MUNE, mid-KAMAKURA, wide TACHI SUGATA. The shallow curve and broad, powerful upper support its large IKUBI-style CHU-KISSAKI. Running ITAME HADA sees MIDARE-UTSURI condensing in steady cascades. The upper is a low flow of GUNOME and KO-CHOJI MIDARE with occasional juts, TAMA and lonely TOBI whisper of missing KAWAZU. The YAKIBA rises in the mid as pointed peaks pull fat GUNOME into bent postures. Their ardent debate settles quickly: High standing OBUSA, KO-CHOJI and GUNOME compete while subtle SHIMA-BA tease at tops. The HABUCHI rides a CHU-width through the lower to find SUNAGASHI and KINSUJI searching the HABAKI-MOTO. A single invection creates two large GUNOME nodules in the wide KO-MARU BOSHI. Very slight KAERI. towards SHO-O - the beginning of late-KAMAKURA. Signature: Small two-characters or long. CAO possible. MORIIYE EI-NIN: Work from EI-NIN to BUN-PO 1317. JI-HADA stands. Beautiful NIOI-DEKI GUNOME, OBUSA CHOJI mixes are seen. of NAGAMITSU. Father of MOTOSHIGE - see MOTOSHIGE School. 1368, O-EI 1394, KA-KICHI 1441 and O-NIN 1467. MORINAGA(1) KA-REKI (f: MORISHIGE 1): To SHO-HEI 1346. KO-MOKUME. GUNOME HA with TOGARI. KINSUJI and SUNAGASHI. Shinogi-tsukuri, Ihori-mune, Koshizori Tachi with Chu-Kissaki. Bo-Hi both sides. Kakudome on Omote. A steady march of Choji Ko-Midare with Kawazuko tadpoles. Ashi and Yo define. Midare-Komi to Hakikake Ko-Maru Boshi. Suriage Nakago has three Mekugi-ana. Signed in Ji at the bottom. 1238. Work seen from BUN-EI 1264 to SHO-AN 1299.
resembles that of MORIIYE. NIOI is tightly defined. provincial sign-post. GUNOME was the new national trend. patterns. His long signature is said to be earlier. MUNETSUNE SHO-CHU (t: SANEMORI): From SHO-WA 1312. ITAME HADA. with ASHI-IRI and KO-CHOJI BA. Shinogi-Tsukuri, Ihori-mune, Koshizori and Chu-Kissaki. Niku in the Ji. Ko-Itame Hada with Ji-Nie and standing Midare-Utsuri. SHINOGI-TSUKURI, IHORI-MUNE, mid to late KAMAKURA transition, KOSHIZORI TACHI. Full NIKU and wide upper hold a broad and round IKUBI CHU-KISSAKI. BO-HI falls from KO-SHINOGI into the NAKAGO. Its wide MOTO-HABA gives the broad blade, a wide FUNBARI where MIDARE-UTSURI dances over ITAME HADA through the JI. Occasional TAMA and TOBI ride the shoulders of never repeating KO-CHOJI and KO-GUNOME in a tightly defined CHU-width below the MONOUCHI. A subtle JUKA tends the rising crowd in the mid. YO cuts dimples into blocks of CHOJI that stand and stumble, while KAWAZU clings motionless. CHOJI becomes SAKA and a little slurred in the lower. The CHU-width MIDARE-KOMI BOSHI finds KO-MARU. A slight back-tilt below the HABAKI adjusts arc for this UBU, two MEKUGI-ANA, KURI-JIRI NAKAGO. Ryo-Shinogi Ken with elongated point. Running Itame Hada has Ji-Nie and Chikei. Sugu Ko-Gunome Ko-Midare Ba showing Ko-Ashi and Yo, Nijuba and Hotsure in Ko-Nie. Boshi converges on the Shinogi. Suriage Nakago has two Mekugi-ana. TSUNEIYE SHO-O (f: MORIIYE): Founder of TSUNEIYE KOZORI Group. MIDARE BA. O-AN KOZORI TSUNEIYE is a descendant. HATAKEDA MEI: BISHU OSAFUNE TSUNEIYE. MUNEIYE KA-TEI: Father of MORIIYE. KO-MIDARE of GUNOME-MIDARE HA. 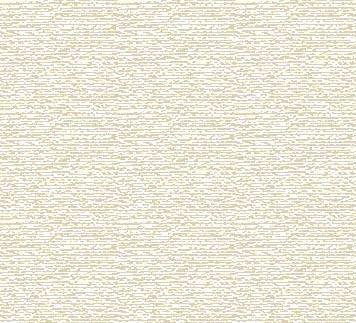 MUNEIYE BUN-PO: MOKUME. Even height GUNOME-CHOJI BA. IYEMORI(1) GEN-TOKU: KO-MIDARE BA with ASHI. 2nd to KOZORI. 1352. These are HATAKEDA descendants doing KOZORI style. O-EI, see OEI BIZEN. KO-MIDARE BA.